Mrs. Rana Shubair, IUG Graduate, is the author of a book titled “In Gaza I dare to dream”, which is a memoir about her life and the lives of her people who are living under Occupation and Siege. In her first book, Mrs. Shubair talks about the harsh living conditions imposed by the Occupation that hinders opportunities for the youth and puts every obstacle in their way to crush their souls and ruin their lives. 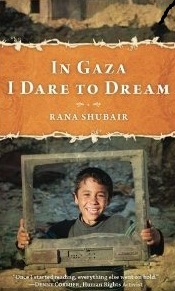 In 'In Gaza I Dare to Dream', Rana vividly recounts details of her own life under Israeli Occupation, aggression and the Gaza Siege. The daily suffering of the Palestinian people is seldom mentioned in mainstream media; therefore, Rana takes you on a journey to one of the most war stricken parts of the Middle East to tell you the story of the ordinary people of Gaza. Gaza, a land where joy and grief are entwined, yet its people dare to dream, dare to love and struggle to gain their freedom and basic human rights. Mrs. Shubair added that thousands were killed, injured and traumatised in the 2014 Israeli aggressions on the tiny Gaza Strip. In other parts of occupied Palestine, the number of children held in Israeli prisons and given sentences is alarming. Defense for Children International-Palestine reports that Israel is the only country in the world that systematically prosecutes between 500 and 700 children in military courts each year. It is noteworthy to mention that Rana is a graduate of the Islamic University of Gaza and is a Palestinian writer. She specializes in English language training, testing and translation. Rana currently lives in Gaza with her family and has lived a part of her life in the USA. She started writing at a young age and published works on women and Gaza on numerous websites like opendemocracy.net. She's a mother of three and hopes one day her children will travel to see the world that exists outside Gaza.